Many of the postings ask you for the cover letter enclosing employment and salary history. There may be several reasons behind asking for the cover letter. Your cover letter with salary history mostly decides your salary so you should be very much careful when writing this type of cover letter. Salary history is the history of the salary of the candidate of their previous job. Most of the employers ask for the candidate’s salary history when applying for the job. The salary history is based on many factors such as the previous experience, industry, and cost of living. When you have been asked for the cover letter enclosing employment and salary history then you should include a range of salary rather than mentioning a specific amount. This will give some compensation when you will be discussing the salary of your new job offer. Always be honest when writing about your employment and salary history in the cover letter because the employer can check your salary history with your previous employers. If you include any wrong information then your name will be removed from the application. You can also write your salary requirement in the cover letter so that the employer knows about your requirements and demands. 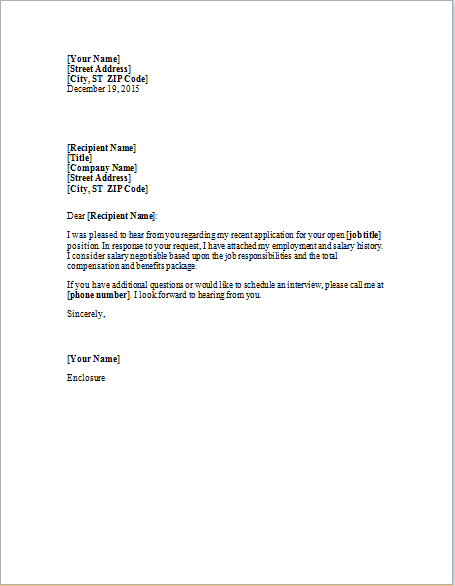 Cover letters are very important as it is the first impression on the employers. So, always write an effective cover letter as a poorly written cover letter can throw your resume to trash. I am writing this letter to profess my interests in the [Job Titled], for which the hiring notice has been displayed on [Website]. I have been working in the [Field Name] for [Number]. During this time, I have been able to develop my skills and gain experience by working at different organizations. Therefore, I believe I can be an asset for your organization. I am currently working as a [Current Job Position]. This current job requires me to [Job description]. Before this I have also worked as [Previous Job Position(s)]. My experience working at different organizations has taught me very valuable lessons. One very important lesson I have learned is creating good relations with the employees of the organization. Having a good relationship with the employees, whether they are working in the same or in another department. Communication is also a very important skill, which I have come to learn of when it comes to working in teams. The salary packages I have previously been working on provides a working pay of [Figure]. The company also provides us with health and [miscellaneous] benefits. My expectation of the salary package is [Figure]. This expectation can be negotiated according to the benefits provided by [Name of Company] to their employees. You will find my resume attached to this letter. Thank you for your consideration. I await a positive reply. Please accept this letter as an application for the position of [Job] for [Name of Company], listed on [Website]. I have been working as the [Job Title] for over [Number] years. Previously I have worked as [Previous Job Title]. Throughout the time I have been working in this field, I have been able to develop many skills that allow me to excel in my work. I have worked as [Previous and Current Job Description], therefore, I believe I can be of great use for your company. Previously I have been working for on a salary package of [Figure], with the benefits added to the salary. My current expectation for a salary package is between [Figure], which is flexible and negotiable depending on the benefits provided by the company.